How could we miss this adventure of a lifetime? Especially since the puppy has never been to the beach or anywhere near that contained large bodies of water before (e.g. 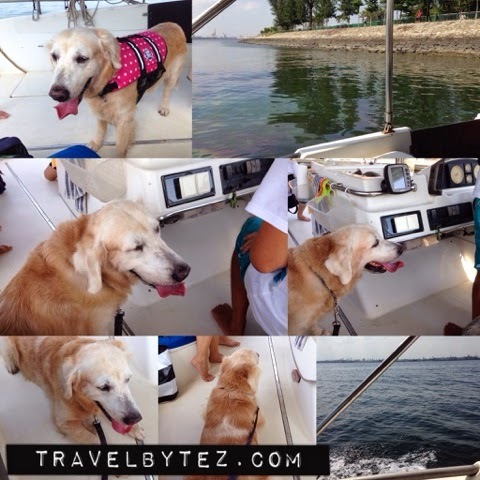 the sea) – a day out at sea cruising with other furry friends. I was also curious as to how the puppy would react to this new experience and how he would behave (since there were going to be other dogs). And thankfully his behavior was stellar that day! The sun was out and it was a hot hot day, reminding me of my holiday in Bangkok a couple of weeks back, but the puppy was excited and rearing to go. When the transport arrived, he happily jumped into it, thinking that it was just another ordinary day for grooming at Petopia. But when we arrived at the destination, he was a little disorientated with that adorable clueless expression of his, looking quizzical. At first apprehensive about the odd object (the boat), it took a bit of convincing to get the puppy to board the boat. Once on the boat, the doggies started warming up to each other while the skipper and operator of the pet cruise shared with us his story: in short, he realized that his own dog enjoyed the trips out to sea and decided to offer this experience to those who would want to enjoy a sea bound activities or just cruise with their beloved furry friends (apparently not exclusive to dogs only). You can read about the full story here. If you want to find out more about the rates and capacity, you can check it out here. First stop was somewhere at sea where the doggies could try their paws at swimming (in the sea), under supervision of course. Unfortunately none of the doggies had actually swum before, so all the humans decided to give it a miss. 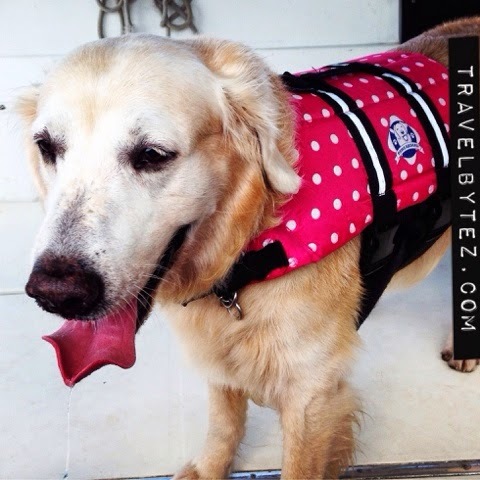 However, puppy willing tried on the life vest (for dogs), just to see whether it would fit him (it did!) and how he would look in it. After two unsuccessful attempts to get him to jump into the sea to (try to) swim (since he had the vest on we decided to try), we proceeded to our next destination – the beach (along Punggol I think). The sand was soft and fine and thankfully it wasn’t that hot (we were barefooted). It was the doggies first encounter with the sand and the sea(waves). Yoyo and Muffin were amazed by the soft texture of the sand (Yoyo seemed to enjoy eating it!) and a little intimidated by the incoming waves (to the seashore). But puppy, he was acting all cool and composed (in front of the girls), which was a little funny. The only slip-up was that he attempted to drink the seawater, by attempt I mean, two small sips before realizing that this water was different. His expression was priceless, as soon as he realized that the water was salty he pretended that it was nothing and walked away as nonchantly as he could. Soon it was time to head back to the boat and back to the jetty, by the time the doggies were on board, they were happy but almost dozing off (it was such an exciting day for them). 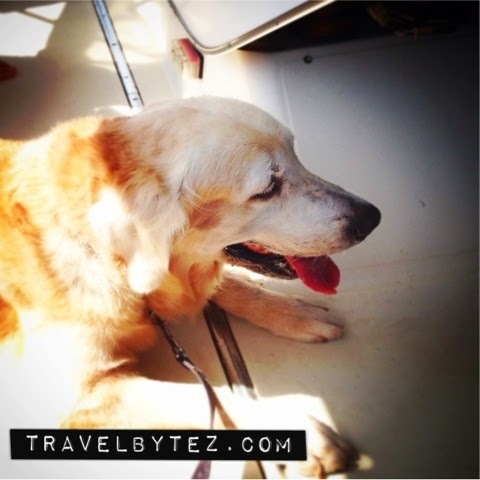 When we arrived at the jetty and alighted, the puppy did the most amusing thing… he actually made a u-turn and wanted to get back on board the boat for round 2! It took some convincing to pull him away and tell him it was time to go home.